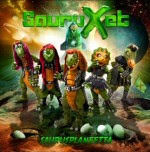 The music of SAURUXET is very 80'ies-sounding melodic metal and hard rock, well performed and produced. The lyrics have been written to appeal to the pre-school and elementary school children, so there are songs about things that that age group can relate to. For example, there are songs about visiting a candy factories, goblins, little green men and treasure maps. And dinosaurs, of course. Sure it's kinda weird to listen to these songs and I can't really relate to the lyrics, but then again, if I can listen to the obscenities of Steel Panther or the worship songs of several christian bands and enjoy them, why I couldn't enjoy these songs too? The style of the songs ranges from the power metal á la Teräsbetoni, Manowar or Stratovarius to the melodic rock of Europe and Van Halen. The influences are at times very thinly disguised, take the title track for example. It's a song about leaving for another planet, and features a familiar sounding keyboard parp... You can easily spot some other familiar bits and pieces here and there.